At the time of writing this story, 23-year-old Judith (not real name) was recuperating with heavy dosage of antibiotics. She was not ill, and neither was she down with any flu. She had simply survived one of the worst sexual attacks in Lagos in recent times. The incident that would send Judith to the emergency ward, took place around 10pm on Sunday, August 28 at 106, Lagos-Abeokuta Expressway, around Pako Bus Stop. Judith’s aunty, a trader in the area, said the young woman had come to her stall around 9pm that day to collect some money. “I told her to wait so we could pack up together later in the evening. She did. But around 9.30pm when I was still not ready, she said she would go home. She had been sick, so, I thought it was better. Some minutes after 10pm, I packed up and left,” the woman said. But to her surprise when she got home, she was told Judith had not been seen since she left for the shop. The family quickly mounted a search for her in the neighbourhood. Her two brothers went in search of her on streets in the area and they did find her. One of her brothers who spoke with our correspondent, explained that when he found Judith, he could not believe his eyes. “Her slippers were all torn, the dress she was wearing was heavy with blood. She was unsteady on her feet. She could hardly stand up,” he said. A picture of Judith taken soon after she was found showed the ivory-coloured skirt she was wearing blotted with large patches of blood behind and in front. His brother told our correspondent that when he became frantic and started asking what happened to her, she could hardly talk. 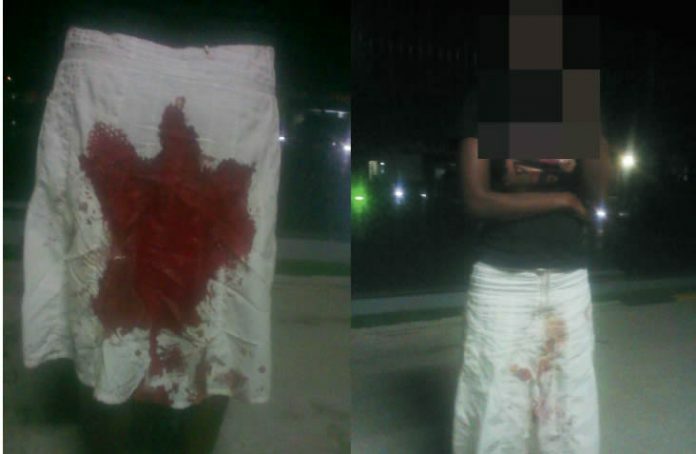 Judith told her family that the men grabbed her as she crossed the expressway on her way home. She said when they covered her mouth and dragged her to house number 106, which faces the expressway, they took her inside and forced her to take Indian hemp three times before they raped her. The two men who allegedly raped her were later identified as Wasiu and Monaco, the names they are popularly known by on the street, while the man who boasted of being the one who gave her the Indian hemp was identified as Olanrewaju Osinubi. Wasiu and Monaco are currently on the run. Judith’s brother explained that while he argued with the two men, who initially came out, other men came out of the house and joined them, threatening that if he did not leave with his sister, he would be beaten up. He said, “While we were arguing there, I luckily saw a patrol van of policemen from the Dopemu Police Division passing by and I quickly approached them and explained how my sister was raped. “The policemen came down from their vehicle and because the crowd of boys in front of the house were threatening, one of the policemen cocked his gun and they all fled. While at the station, it was learnt that Judith continued to bleed heavily as everywhere she sat was soaked with blood. The police asked the family to take her to the Mirabel Sexual Assault Referral Centre for treatment that night. But by the time they got there around 12.30am, the centre was close. But officials at the Lagos State University Teaching Hospital, where the centre is located, referred them to the Ifako General Hospital, where sexual assault cases are also treated. After the initial treatment there, Judith was again referred to the Mirabel Centre the following day where she was eventually given comprehensive treatment. It is unclear whether the centre has sent the report of tests conducted on Judith back to the police as is usually the practice. However, Judith’s family alleged that they became like bystanders as soon as her case got to the police station. 234forum.com learnt that the case was eventually transferred to Isokoko where two policewomen were detached to follow Judith’s family home. Again, the family said they were shocked when they got home and the policewomen told Judith to take them to where the incident occurred. “She was sleeping when they came. She was still in a terrible state. The police brought the suspect to our home and told us to wake her up so that she could take them to where it happened. It was so ridiculous that they could make her go through that at that point. I was angry but we eventually agreed,” the victim’s brother said. Judith’s aunty, who followed them to the scene of the attack, said they asked Judith to point to where it happened and she did. “She showed them the place and even the chair on which she was raped. It was very wet as they had just washed off all the blood,” the woman said. However, the family said they were surprised when the police charged Osinubi to court on Friday, September 2, 2016 for simply obstructing police work. According to them, the police have not shown any sympathy for Judith in handling the case and they fear she might never get any justice. It is not clear what the police are doing currently to track down the two suspects on the run as the Lagos State Police Command spokesperson, Dolapo Badmos, did not pick calls to her line. However, an activist, Mrs. Esther Ogwu of the Esther Child Rights Foundation, whom the family has approached for help on the matter, said has notified the Sexual Assault department of the Lagos State Ministry of Justice about the case. “We expect that an urgent step would now be taken on this matter. This is not a case that the police should even think of sweeping under the carpet. “This case is not just about her, it is about other young women and girls who are in danger as long as those men are still on the loose. But I do not think the police have realised how terrible it must be for the victim that she may not get justice,” she said.